Nope, it’s not abandoned tracks through, say, rural Maine. 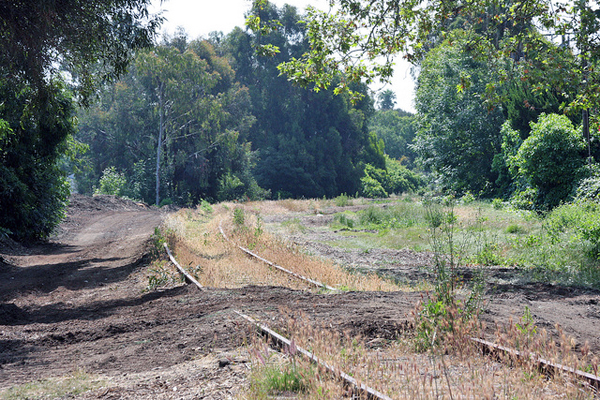 It’s the abandoned tracks through West L.A. that will soon be home to phase two of the Expo Line Line between Culver City and Santa Monica. The shot shows the stretch of track between the Santa Monica Freeway undercrossing and Overland Avenue. Check out more Expo photos at Friend of Expo Line’s Flickr photostream. How are we looking at resolving getting the Expo Line under the 10 freeway?? Does that underpass have to be completely revamped?? I hope Expo Authority will try to keep as much as the foliage as possible. It would be a shame to see it all cleared out. With it this could be one of the best segments to ride through. A reminder of why its better to take the train rather than sit in traffic on the 10. It does look beautiful, but the beautiful foliage along the Gold Line in NELA and South Pasadena seems to be the cause for the annual service disruptions due to landslides, windstorms, tree trunks falling, etc.